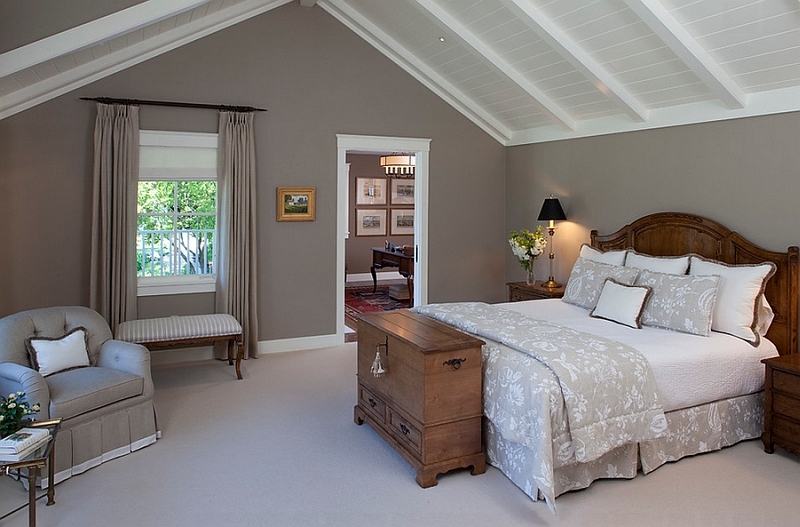 Classic, elegant and comfortable, the farmhouse style of decorating is all about keeping things simple and organic. Unlike many other modern interior design styles, this particular approach allows you to decorate with a wide variety of accessories and furnishings that add a touch of inimitable personality to your home. 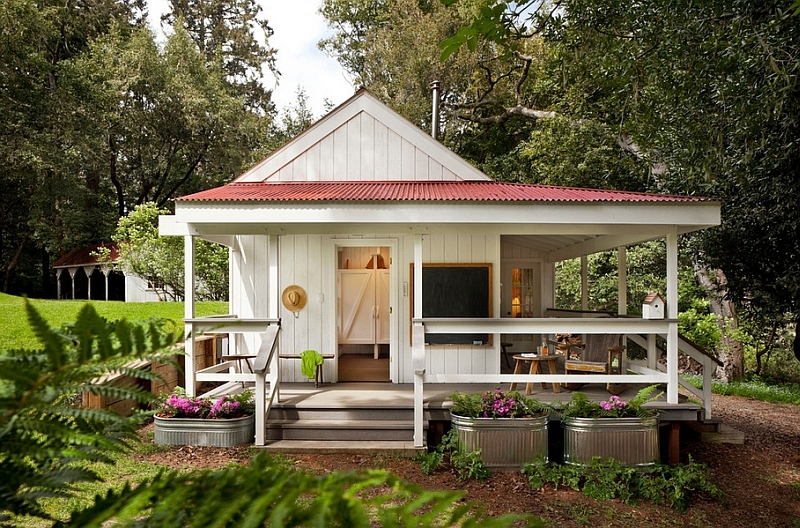 Pretty much any home can embrace the farmhouse vibe regardless of the landscape that surrounds it. Rustic, minimal and cozy, this style allows you to turn up the element you wish to highlight the most with a simple tweak in the finer details. One of the convenient aspects of the farmhouse style is the flexibility it offers, enabling you to decorate with your personal decor collection and vintage furniture that you might have fallen in love with. The gorgeous farmhouse style is about finding an appropriate place for everything that you love and ensuring that you live at ease while enjoying the many sights and sounds outside! Crafting a farmhouse-style home is as much about paying attention to the exterior as it is about decorating the interior. 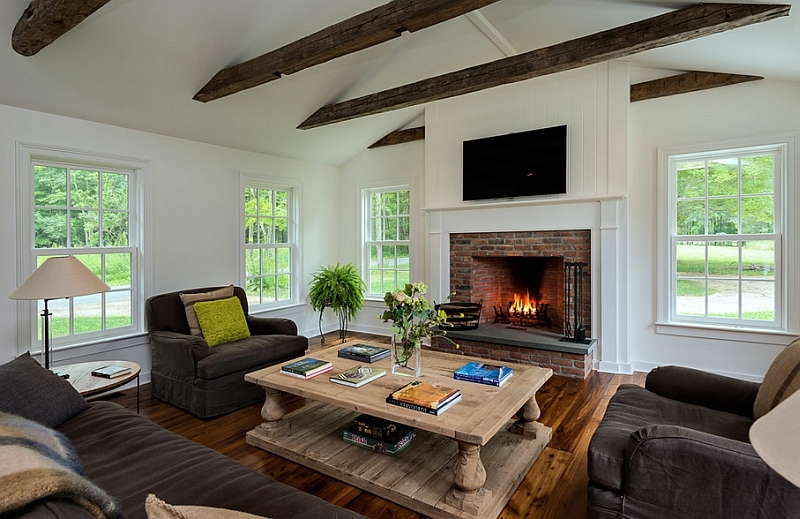 Defining architectural elements of the farmhouse stand out the moment you get close to the house, and you really need not step in to comprehend and soak in its relaxing ambiance. 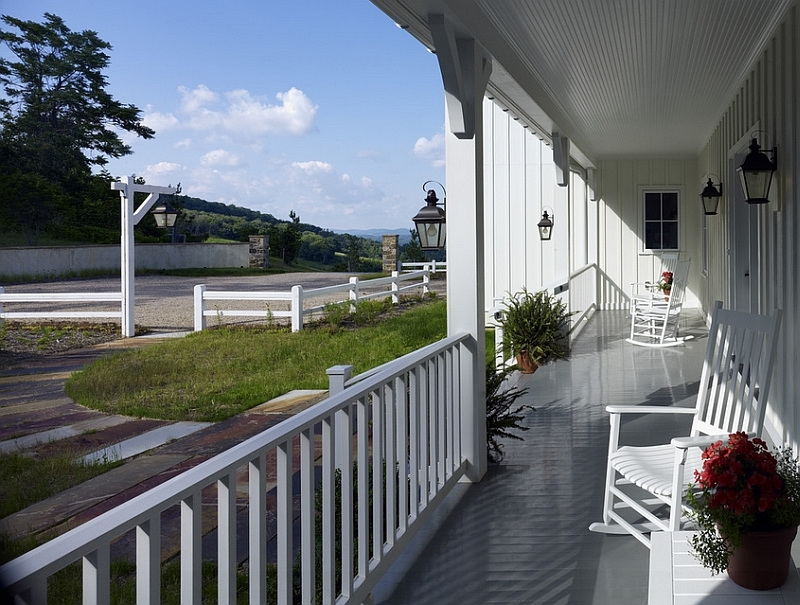 A wraparound porch is the best way to achieve the classic and timeless farmhouse look. This is one element that really sets the tone for the remainder of the house. 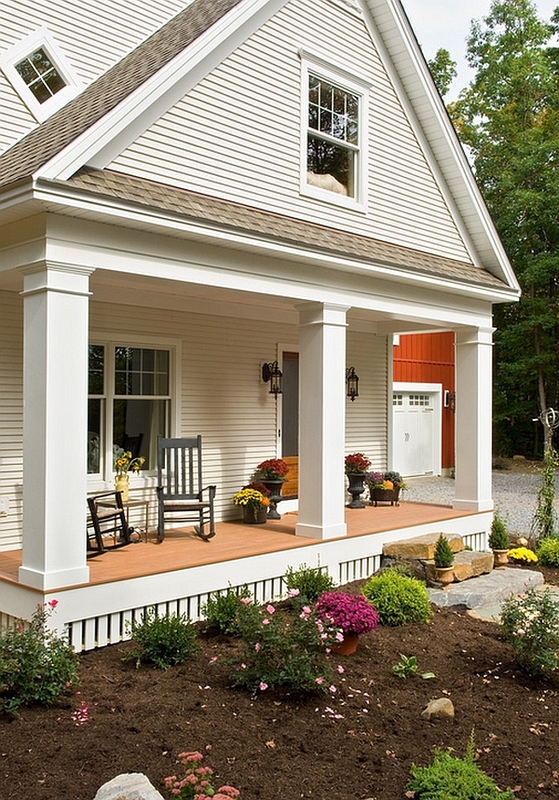 If you are short on space, then a simple front yard, porch, balcony or patio will get the job done as well. It is less about size and more about getting the decor right! 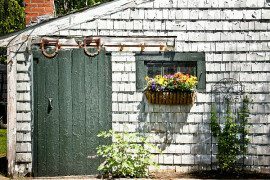 Fill your wraparound porch or patio with a couple of rocking chairs, some potted wildflowers, a few lovely roses and maybe even a few hanging vines and creepers that wrap themselves around the wooden posts. 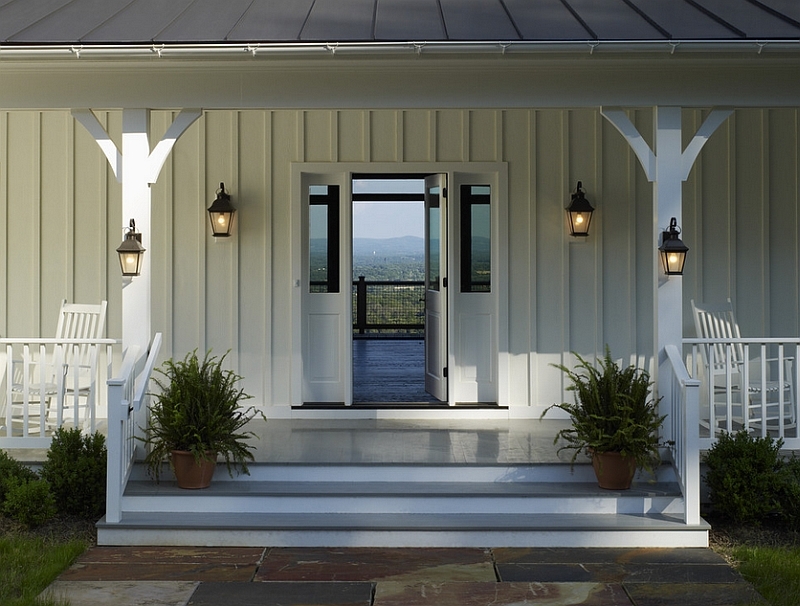 Lantern lighting is another simple and effective way to usher in the farmhouse vibe without going overboard. 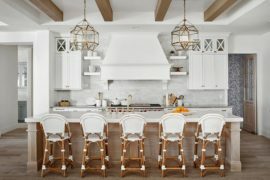 While wooden accents seem to be becoming more and more popular with each day, wood is the major component that makes the farmhouse style so unique and special. It dominates the entire house, and using wood wall paneling, hardwood floors and even ceilings with exposed wooden beams emphasizes and accentuates the classic cottage appeal. Since wooden surfaces age ever so beautifully, your home will only get better with time. If you are not very happy with using wood in an extensive fashion, then make sure the stone and concrete that you use have a more rustic, unfinished appeal. 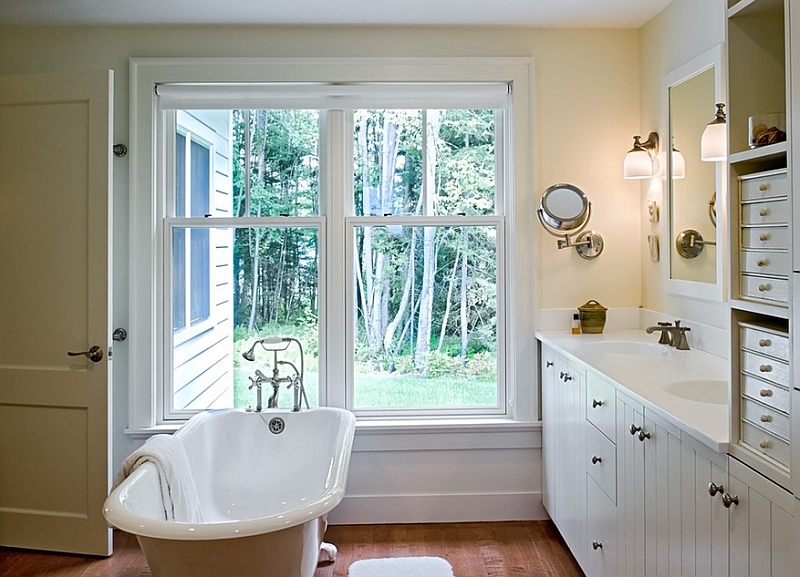 Apart from the traditional French doors and windows, ensure that glass is kept out of the farmhouse-style home as much as possible. 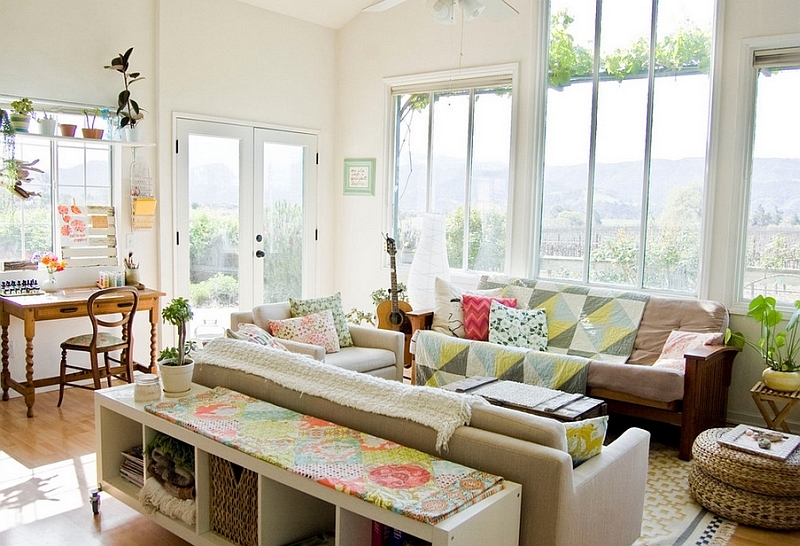 Modern glass windows or sliding doors tend to kill the natural, rustic vibe of the design theme. 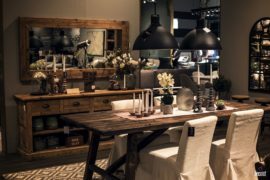 Furniture crafted from natural wood is also a wonderful way to add to the farmhouse warmth. Remember that the most basic elements of farmhouse style have their roots in frugality and accessibility to modern materials (or the lack of them). 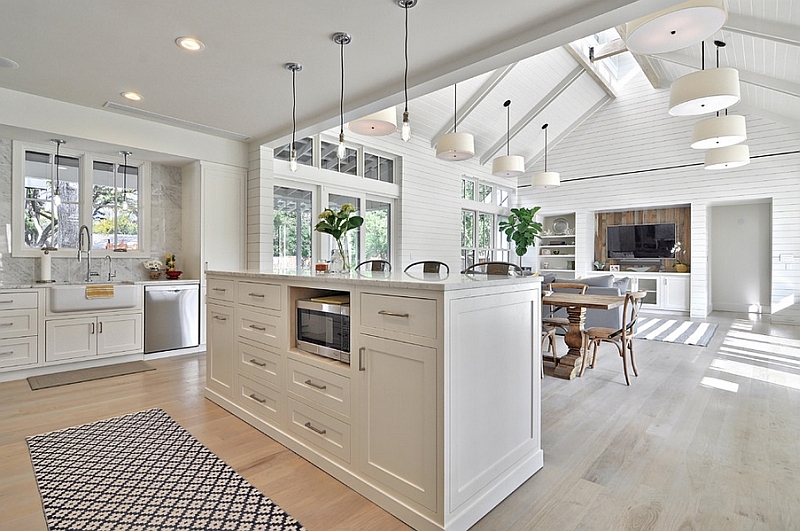 White is predominantly the only color that you find in most farmhouse-style modern homes and it makes perfect sense. Since many of the early owners had a limited painting budget, they went for the simple, all-white look. 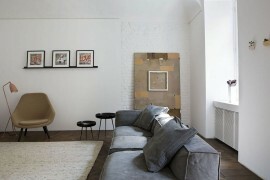 If you want to add a touch of color, then light beige or cream also work well. 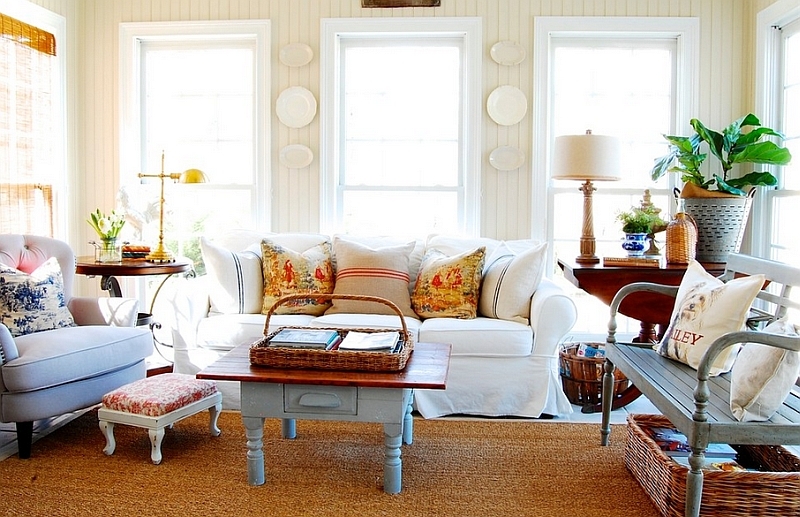 But stick to white as much as possible to usher in the authentic, traditional farmhouse aura. 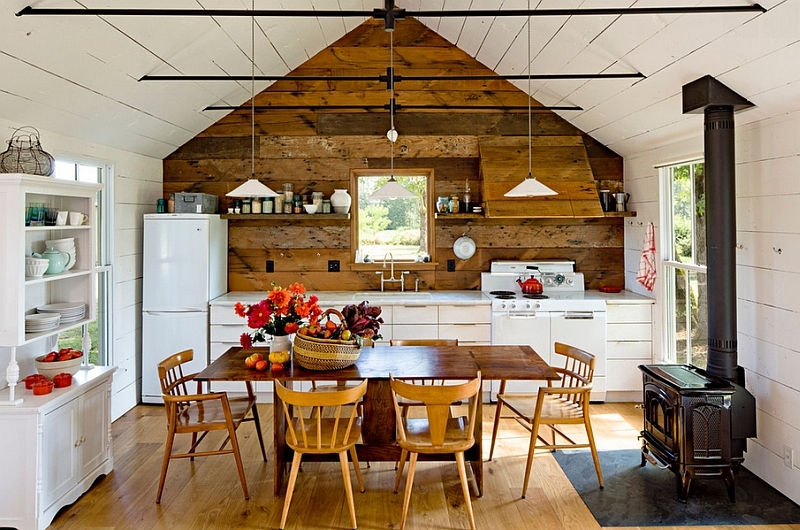 The kitchen is the heart and soul of pretty much any home, but it becomes even more important in a farmhouse-style home. The traditional farmhouse sees plenty of traffic around the kitchen and dining area, and hence, these two elements define this design approach and set the tone for the remainder of the house. 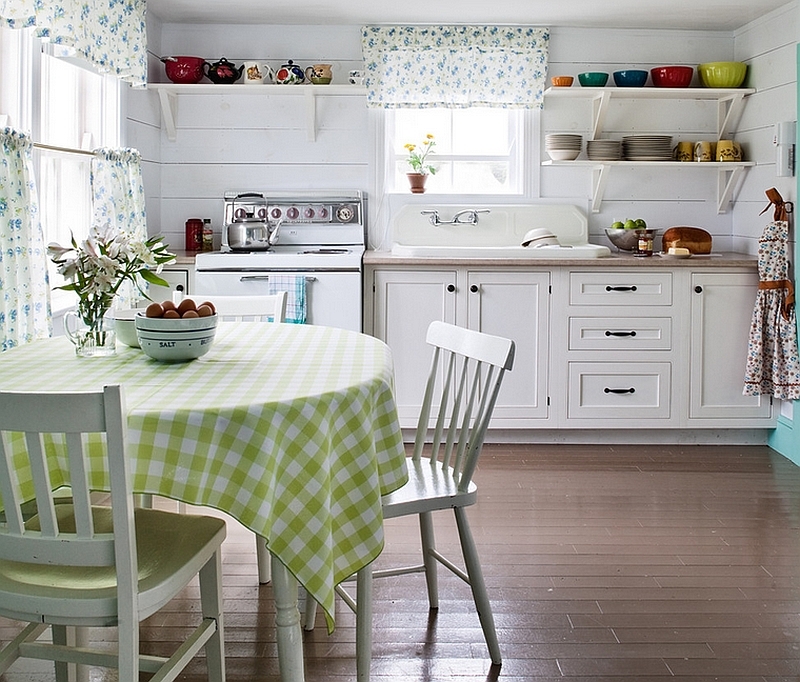 A farmhouse-style kitchen keeps things uncomplicated and vibrant. 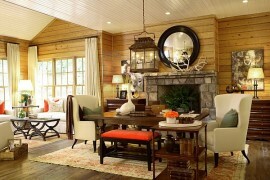 While the color scheme is still neutral, feel free to incorporate an eclectic mix of furnishings. 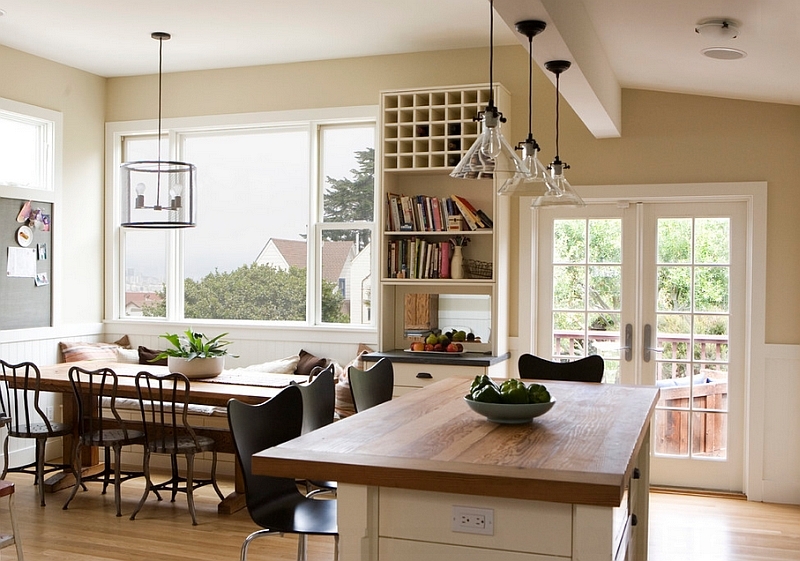 Once again, wood makes a huge statement here, as it engulfs both the butcher block countertop and the kitchen island. Pot racks, apron sinks and white china add to the farmhouse style, while a stoic and vintage wooden dining table coupled with painted chairs anchors the dining space. Feel free to add antique chandeliers and classic prints that take you back in time for a more genuine look. 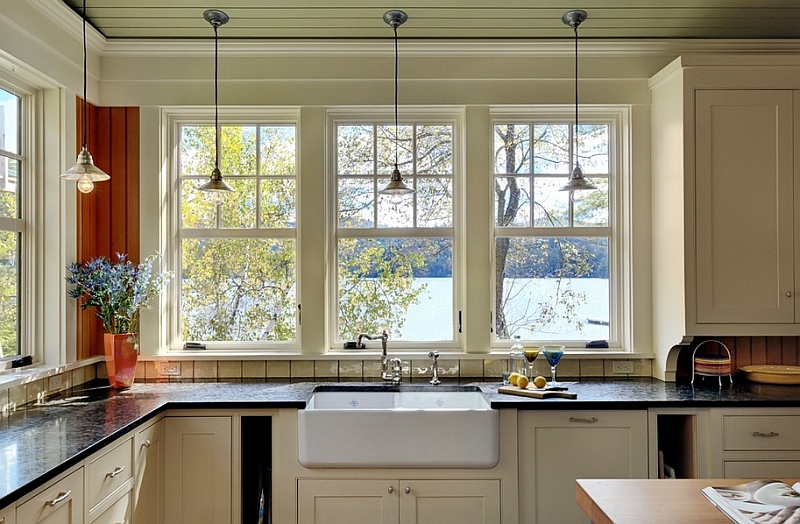 Have you ever noticed the large open shelves and cabinets with glass doors framed in wood that dominate farmhouse-style interiors? These inherently simple and rustic shelves instantly bring in the farmhouse look without placing great demands on both the available space and your renovation budget. These open shelves add character to the wall and allow you to switch between decorations with ease. Once again, you can mix and match shelves in different styles to achieve the look of your choice. Just make sure that you keep the color to a bare minimum! Throw in some heirloom-style decor and fabric to bring the farmhouse style into your living room and bedroom. Cotton is obviously the preferred choice, but you need not be too picky about the material. Simple stripes and checkered patterns look good as accents and throw pillow covers, as they add some much needed color. Do not worry about finding matching pieces that fit in perfectly, as the farmhouse style allows you to easily pull off an eclectic blend of chairs, beds, couches and fabric accents. The farmhouse-style fireplace is a touch harder to create, and you might not always pull this off unless you get it absolutely right. A vintage mantel and a brick exterior lend a touch of authenticity and allow you to create a snug, dreamy nook that will get you through even the coldest of winter days. 7. Vintage with a Modern Touch! 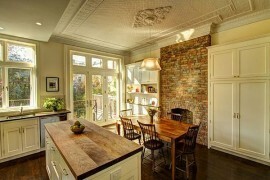 There are many little tricks and tips that allow you to embrace the farmhouse look without going in for a major revamp. 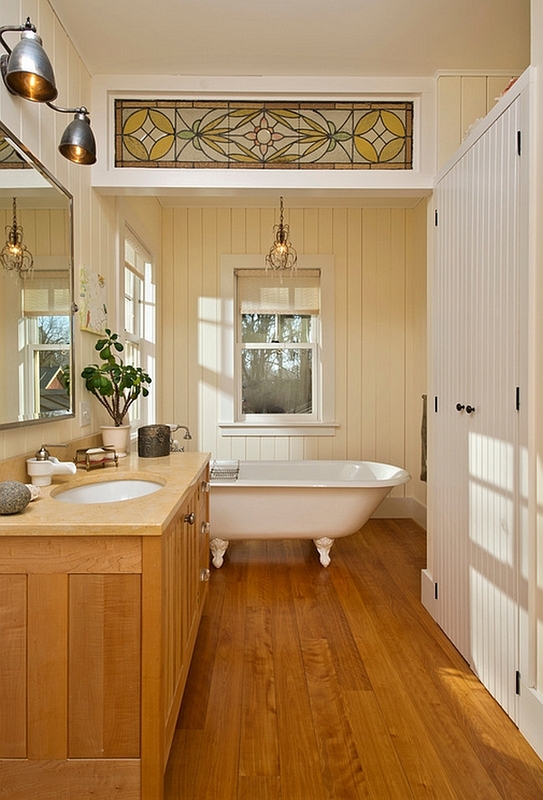 A simple claw-foot bathtub that is painted in a muted hue is both trendy and fits the theme seamlessly. Lovely wooden cabinets and side tables also lend the woodsy appeal without forcing you to redo the flooring entirely! Allowing you to blend the vintage with the modern (not contemporary), this is a style that firmly places function ahead of picture-perfect appearance. If you are short on vintage finds, just shop at your local antique show, and soon you will have some peerless decor that you can proudly showcase. When decorating with the farmhouse style, always draw inspiration from the origin of this unique look. It is a simple and effective way to embrace it and will give you the perfect backdrop that allows you to improvise with your own personal touches. 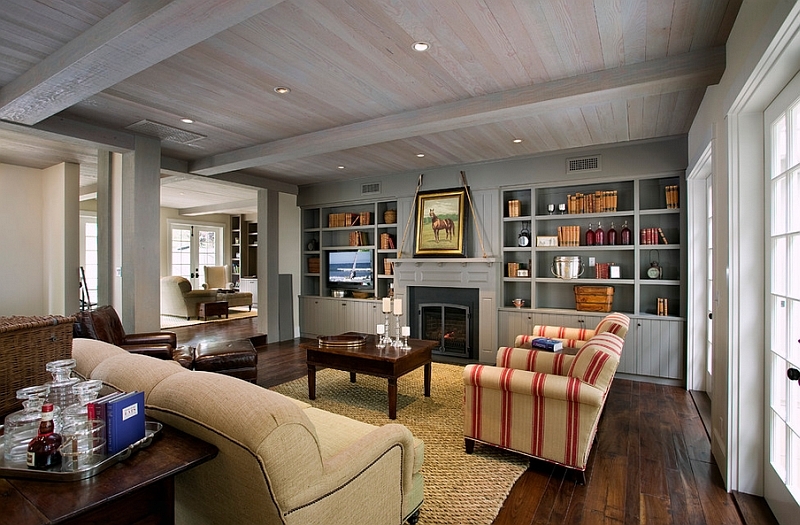 And unlike many other design styles, farmhouse interiors seem more graceful and charming as they weather with time!